/ Kaohoon International / IVL’s Acquisitions Bear Fruit, 3Q18 Profit Leaps 185% to ฿10bln.!! IVL’s Acquisitions Bear Fruit, 3Q18 Profit Leaps 185% to ฿10bln.!! A total of nine acquisitions this year help supporting IVL’s profit to grow 185% YoY. 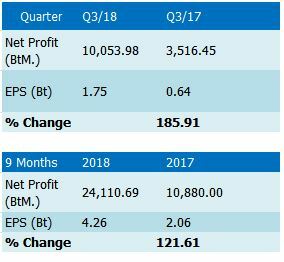 IVL’s 3Q18 profit was ฿10,053 million, increased 185.91% YoY from ฿3,516 million, while the 9 months profit also grew 121.61% YoY from ฿10,880 million to ฿24,110 million. In the third quarter of 2018, production was 2,730 thousand tons, 14% YoY increase, driven by contribution from new and existing volumes. 3Q 2018 operating rate was 89%, down 5% from 92% in 3Q 2017, primarily due to addition of 1.8 million tons of new PTA and PET capacity as well as unplanned shutdowns across the portfolio. The plants in Egypt and Portugal are successfully ramping up and are expected to fully contribute in the quarters to come. In the PET segment, 3Q 2018 production was 1,161 thousand tons, up by 17% YoY, supported by volume contribution from Brazil (full quarter impact) and Egypt (partial quarter impact). 3Q 2018 operating rate was 89%, down 3% from 92% in 3Q 2017. However, on the same portfolio basis, excluding Brazil and Egypt, PET operating rate increased in 3Q 2018 to 95%. In the Fibers segment, 3Q 2018 production was 408 thousand tons, up 25% YoY, with operating rates at 93%, up 12% vs 82% in 3Q 2017, driven by strong demand growth across all regions as well as volume impact from Avgol, Durafiber, Performance Fibers and Sorepla, partly offset by force majeure by a raw material supplier in Europe. In the Feedstock segment, 3Q 2018 production was 1,1161 thousand tons, up 8% YoY, with operating rates at 83%, down 12% from 95% in 3Q 2017, primarily due to 12 days unplanned outage at EOEG plant and addition of Artlant PTA (ramping up). Moreover, IVL had made 9 acquisitions so far in the international markets. Corpus Christi JV, US – will create new and exciting ways to serve our customer needs by expanding our PTA-PET asset base in the Americas. Brazil PET (completed 24 May, 2018) – creates entry into Brazil market as the leading producer. Egypt PET (completed 14 Jun, 2018, production started in Aug 2018) creates entry into African markets as the leading producer. Avgol enhances IVL’s HVA portfolio and market share in the hygiene segment and as the leading producer in Russia and India. Kordarna (completed 30 Oct, 2018) – propels IVL to a leading tire cord producer in Europe and globally with synergies across the automotive platform. Medco (expected completion in 4Q18) – strengthens IVL packaging footprint in attractive and growing African market with synergies with our Egypt PET business. Sorepla (completed Jul 31, 2018) – complements IVL recycling business in France with synergies with our Recycled Fiber and PET businesses in Europe. Schoeller (expected completion 4Q18) – will enhance IVL HVA fibers portfolio and energize our worsted wool business. M&G Fibras (expected completion 4Q18) – will position IVL as the largest polyester fiber producer in Brazil and gain synergies from our PET operations and common infrastructure.